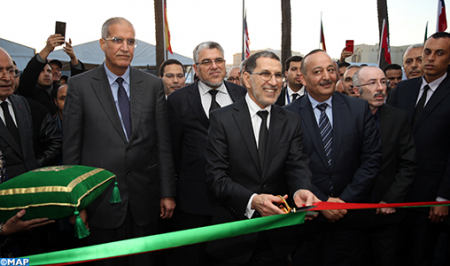 Casablanca -february 9,2019 -(MAP)-Head of Government, Saad Dine El Otmani, inaugurated on Thursday the 25th edition of Casablanca International Book Fair (SIEL), in the presence of several leading figures from the spheres of politics, culture and diplomacy. More than 700 exhibitors from 40 countries take part in the event, which is held under the patronage of HM King Mohammed VI (Feb. 7-17). For this edition, Spain has been chosen as the guest of honour. Casablanca Book Fair, which is gaining in fame year after year, attracts several publishing houses and exhibitors from all over the world and is marked by the quality of the cultural products exhibited, El Otmani told reporters. The choice of Spain as a guest of honour testifies to Morocco's openness to the most widespread cultures in the world, he said, noting that this edition will promote cultural exchanges with Spanish-speaking countries, through dedicating a pavilion to Latin America. For his part, minister of culture and communication, Mohamed Laaraj, said that SIEL has become a can’t miss event on the cultural scene, given the quality of the books displayed and its role as a platform for free dialogue. The choice of Spain as a guest of honour reflects the strength of the distinguished longstanding relations between the two countries, he pointed out. The fair is a good opportunity to shed light on the special ties between the two kingdoms, Spanish ambassador to Morocco, Ricardo Díez Hochleitner, told MAP. Organized by the ministry of culture and communication, this edition is marked by the participation of 350 writers, poets, researchers, economists and politicians from around the world. The 2019 edition also includes the awarding of Ibn Batouta Prize for travel literature.